Ahmed Sani, the governor of Zamfara state, the first to implement Sharia, tells the BBC about how it has been working three years on. What do you say to those who say Sharia sentences are not being carried out? Sharia sentences are followed. The only area where we don't have any cases in court, is stoning to death. We had two amputations in the past. But you do not want amputations every time. People don't steal now in Zamfara. Why are more severe sentences, like stoning to death, not being carried out? Well, you see, the essence of Sharia law itself is to deter people from committing offences. That is why there a lot of provisions in the law for appeals and if proper procedures are followed, you hardly find any people given such sentences. I will compare this issue with the Ten Commandments of the Bible. The essence of the law is to insure that people fear God and know their responsibility to God, and to fellow human beings and the responsibility of the government. For example, it is the responsibility of the government and the society at large to ensure the basic needs of the people are provided. And once you provide society with basic needs, you will hardly find anybody stealing. Are you not worried some people in the state might think you are going a bit soft? I am not worried at all because every Friday from 1000 to 1200 we enlighten people on what is Sharia. 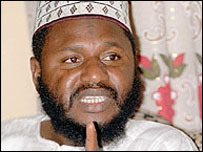 Before the introduction of Sharia in Zamfara, people did not understand what it was about. They thought that Sharia was like in the past - we behead people, we amputate people. But now they know what Sharia is all about and they are happy that we have Sharia. What is the view in northern Nigeria on the abolition of the death penalty? It's not only northern Nigeria, which has the problem of abolishing the death penalty. It touches on the faith and belief of Muslims all over the world. Muslims believe that the holy crime is supreme and once there is any problem associated with the killing of a human being, the penalty is death for those who have killed other people. If you say that you are abolishing such sentences, it is as if as you are removing some verses of the Koran from the Holy Koran. What would happen if the Nigerian Federal State abolished the death penalty - would Sharia law have to comply with that? It is not possible, because the majority of the members of the Nigerian national assembly are Muslims. Not only the northerners - we have a lot of southerners who are Muslims. So I never think of what will happen, because I know the law will not be passed by our national assembly. Why are Muslims so in favour of the death penalty, when a lot of countries now think it is barbaric to kill somebody and have the state take revenge in that way? Well, because we believe that if you have a society that allows killing of human beings and just be imprisoned you will find people ready to commit murder easily. But if you know that you are going to be killed when you kill, you will think twice before you kill anybody. What about the adage that two wrongs don't make it right? The definition of wrong is subjective. We have to define what is wrong and what is right. As far as I am concerned, it is not wrong to kill somebody who kills.